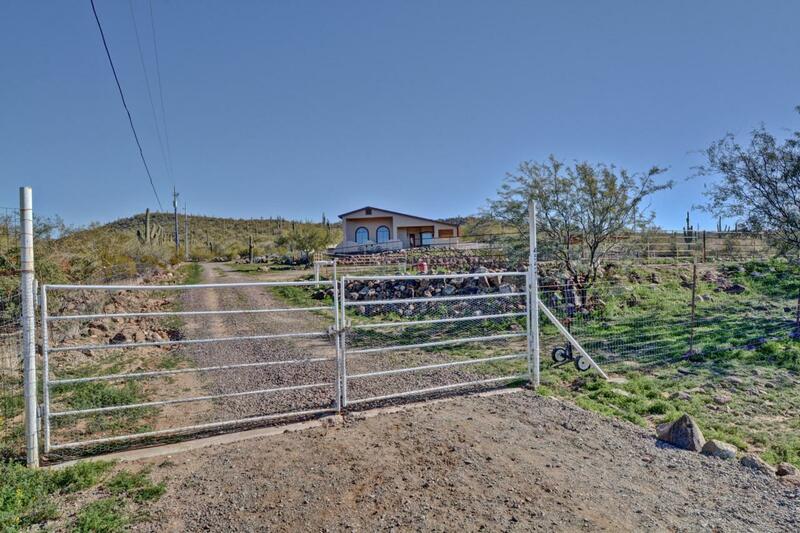 AMAZING RARE FIND; Gorgeous CUSTOM home JUST 2 lots south of Tonto Nat'l Forest at end of short private Rd, on gated & TOTALLY fenced 2.4 acres w/ complete HORSE Setup includes 240X80 Arena w/water & light, tack room,Large covered Hay storage, & stalls; easily expandable on this 2+acres. Separate workshop,/storage, deluxe chicken coop, fenced garden area, &covered shade for,truck,trailer etc. as well as the Extended 3 car garage w/220 service. Quality built beautifully appointed CUSTOM home offers Country warmth w/ wood finishes along with dramatic design of soaring living room ceilings, featured floor to ceiling wood/propane fireplace,large windows w/radius windows at top & beautiful plantation shutters to allow full impact of Amazing Mtn. Views. Must see to appreciate! (Click on more)Dinner preparation will be a pleasure in this Open kitchen with GRANITE Counters, island with SEPARATE VEGGIE SINK and Water Purifier, Large main Farmhouse Sink, breakfast bar, Hickory Cabinetry w/PULLOUT SHELVES & SOFT CLOSE drawers, and convenient WALK-IN PANTRY. SPLIT MASTER floor plan offers Loft/OFFICE and separate Master Ensuite 1/2 level up for privacy and to take advantage of the SPECTACULAR VIEWS from the covered BALCONY. Roomy Master includes separate soaking tub and shower, walk-in closet and secondary closet. This exceptional home also offers a generous family room/game room/media room with 2nd and 3rd bedrooms off of it. Plenty of room so 4th BEDROOM could easily be framed in as well. Make life easier with OVERSIZED Laundry room off the kitchen with cabinet offering Washboard laundry/utility sink, and plenty of ROOM FOR FREEZER or secondary fridge and storage. This 2+ acre property offers great privacy but also should be able to be split, or can accommodate a pool, guest home, Large RV garage/shop, or additional horse facilities/barn etc. DEPENDABLE WELL that has never run out of water and has newer pump above as well as the submersible. Well is also only for one other home and has ample storage tank to prolong life and efficiency of the pump. This well maintained home shows pride of homeownership and has also had exterior recently painted. Come and relax and enjoy the Views, Sunrise or Sunsets, with covered patio on 3 sides of this Impressive Home!